At the 20th Vilenica we played host to poets, prose writers, dramatists and essayists from European countries and beyond with special emphasis on Central Europe. The Vilenica jury advised by the consultants chose men and women of letters from 26 countries. The authors were presented at one of the literary readings and in the Vilenica almanac. The Vilenica Almanac features the following authors: Gregor Papež, son of Slovene emigrants from Argentina; prose writer Anna Mitgutsch from Austria; essayist, prose writer and translator Juras Barisevic from Belarus; poet and journalist Faruk Šehić from Bosnia and Herzegovina; dramatist and prose writer Theodora Dimova from Bulgaria; poet, literary critic and translator Stephanos Stephanides from Cyprus; prose writer Miloš Urban from Czech Republic; poet and essayist Jaan Malin from Estonia; prose writer, translator and journalist Jean Portante from Luxembourg; poet and essayist Leung Ping-Kwan from Hong Kong; prose writer and essayist Veljko Barbieri from Croatia; poetSinead Morrissey from Ireland; poet, prose writer and translator Anna Maria Carpi from Italy; poet Carlos A. Aguilera from Cuba; a Lithuanian poet, essayist and translator Vladas Braziūnas; prose writer Zsuzsa Rakovszky from Hungary; prose writer Olivera Korvezirovska from Macedonia; poet Liliana Ursu from Romania; prose writer and translator Magdalena Tulli from Poland; dramatist, poet and prose writer Viliam Klimáčekfrom Slovak Republik; prose writer Ralf Schlatter from Switzerland and poet, essayist and prose writer Jim McGarrah from the USA. Slovenia is represented by prose writer and editorJanez Kajzer, poet Jure Jakob and poetess from the Austrian Carniola, who has lived in the United States since 1995, Cvetka Lipuš. The translations of the texts into and from Slovene were provided by renowned Slovene translators including Vesna Kondrič Horvat, Lučka Jenčič, Marjeta Drobnič, Sonja Polanc, Silvo Torkar, Klemen Pisk, Gašper Malej, Eva Šprager, Igor Divjak, Tamara Soban, Špela Šramel, Aleš Mustar, Klaus Detlef Olof, Nikolai Jeffs, Marjan Strojan, Irena Samide, Irena Zorko, Tone Škrjanec, Uroš Zupan, Barbara Pogačnik, Marjanca Mihelič, Erica Johnson Debeljak, Sandra Baumgartner, Ifigenija Simonović, Lili Potpara, Jasmina Šuler Galos, Nives Vidrih. The third part of the almanac is dedicated to the contemporary literature of the Beneška Slovenia with introductory essays by Miha Obitand Roberto Dapit, while the last part brings the essays of Ana Blandiana and Pavel Vilikovský on the role of culture in the process of europeisation. We also present poems ofYoung Vilenica Award Winners. The expert part of the programme was imbued with reflections on the Europe of countless faces in which the issue of culture and literature respectively is being reconsidered. How does the united Europe take care of its spiritual traditions? Is it changing – in the Brussels bureaucratic reality – into a melting pot which levels all differences or is it still true to the multicultural identity which appreciates the peculiarities and searches for a dialogue. Some of the former Vilenica Prize Winners discussed these and similar issues at the round-table discussion themed the possibilities of coexistence of different cultures in Europe and the process of searching a new cultural paradigm, moderated by Aleš Debeljak. The (in)ability of a cultural symbiosis is particularly evident in the attitude of a majority culture towards the creativity of the minorities. It is on this very relation that the issue of equality of spiritual traditions and languages is being brought into focus and substantiated. 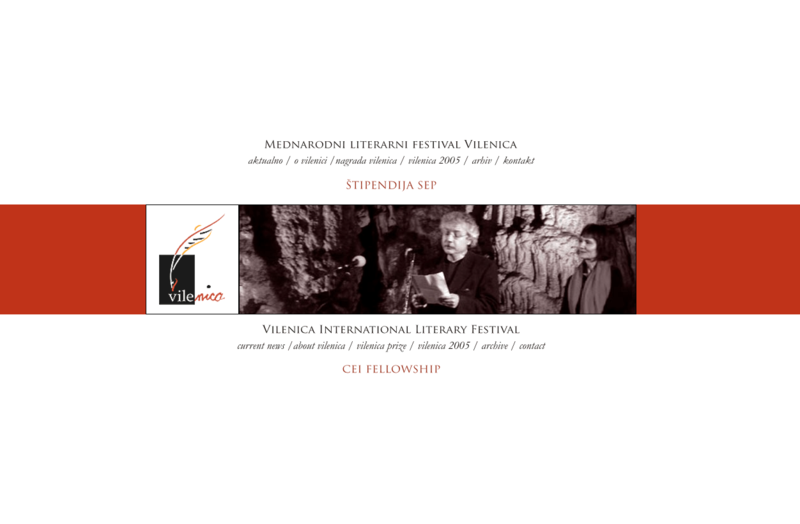 At Vilenica, we presented the contemporary literary creativity of the Venetia (Beneška Slovenija), the often-thankless circumstances in which it is born and endures, its peculiarities in relation to the Slovene literature and the role it plays on the contemporary literary and cultural platform. Prof. Roberto Dapit from the University in Udine, Italy and the president of the Cultural Centre Ivan Trinko from Čividale, Italy, Miha Obit embeded the contemporary literature of the Friulian Slovenia into a literary-theoretical and cultural-historical framework. The presentation and the literary reading took place on Friday, 8 September 2005 at 11 a.m. in the Cultural Centre Srečko Kosovel in Sežana where a book exhibition co-organized by the Cultural Centre Ivan Trinko from Čedad was on view. The future of literatures of smaller nations was the topic of the round-table discussion themed Crosswords of literature: East and West, which took place within the international meeting of organizations promoting literature. The meeting took place on Friday, 9 September at 9.30 a.m. in the Hotel Klub in Lipica. The author of the concept, Gregor Podlogar, hosted guests from various European centres. The issues to be discussed included the promotion of literature in Europe, the role of various institutions, the importance of a nation’s size and its specific characteristics, the effect of recent social changes on the interest of the West in literatures written in the East, and many others. Moreover, cultural centres from Slovenia presented their own experience in promoting their literature abroad, including Slovenia. At Vilenica 2005, the Slovene Comparative Literature Association in collaboration with the Slovene Writers’ Association organized the 3rd International Comparative Literature Colloquium themed Hybridizing Theory and Literature: On the Dialogue between Literature and Theory. The event was chaired by Professor Marko Juvan and Jelka Kernev Štrajn, and it took place on Thursday and Friday, 8 and 9 September 2005. 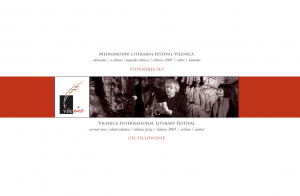 At Vilenica two book novelties were presented, namely the Anthology of Slovene Literature, edited by Vanesa Matajc, and a novel by Vilenica 2004 Prize Winner, Brigitte Kronauer. The latter was presented by the Cankarjeva založba publishing house within the Štanjel matinée, when we awarded the Crystal Vilenica and presented the 5th Young Vilenica Award Winner. Vilenica echoes throughout the year in a number of accompanying events. On 21 May, the Young Vilenica Award was presented in the Vilenica Cave while on 12 July the Slovene Writers’ Association played host to Lithuanian poet, translator, lecturer at Yale and Vilenica 1990 Prize Winner, Tomas Venclova. On 3 October the Cultural Centre Vilenica from Sežana organized a meeting of small publishers.